We've recently launched a competition in which we're going to sending one lucky winner their choice of five of our favourite table lamps. There's no purchase necessary to join and all you have to do is provide your name, your email and click a button to confirm. Everything else after that is optional but I want to jsut take you through how to take each step to get extra entries into the giveaway. First of all, you'll need to head to the competition page on the website: click here. This will open the competition page in a new window. To get your automatic entry, all you have to do is fill out the fields for name and email address. We need these to get in touch with you if you win, so make sure that these are correct! Once you've logged in to the gleam app, you simply need to press the first action "Click Here to Confirm Your Entry". Once completed, you'll see a green check in the box to the left, and that's it! 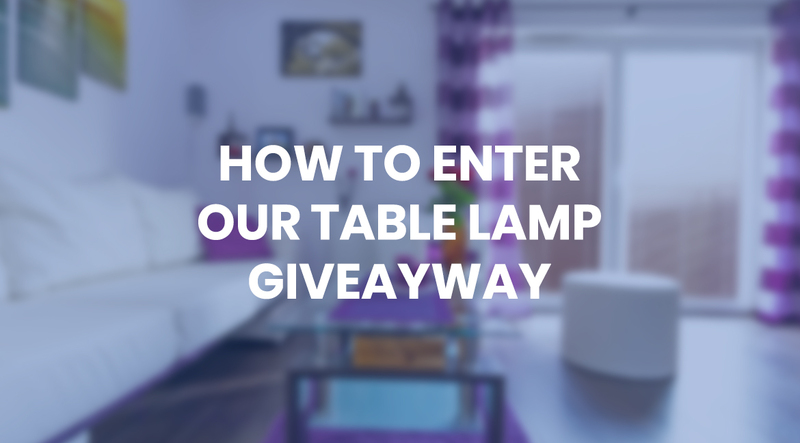 You're all set with your chance to win one of the five table lamps. There are a number of ways to increase your chances of winning. These require you to link up a couple of your social accounts, answer some questions or visit some pages on our website. Completing all of the actions in the competition gives you a bonus of 10 additional entries. First up, let us know which prize you'd like to win by selecting the image. It's simple enough and gets you another entry. Next in the list are the Facebook entries. You need to add your Facebook account to the gleam app to do these, but once done, you'll be able to get a free entry just for linking, and another one for visiting our Facebook page - drop us a like to keep up to date with posts, competitions and sales. We have twitter next, which is similar to Facebook in terms of linking your account, then you just have to get your entry for linking, one for following and one for tweeting out about the competition. The last batch of entries are here to inform you about the products we're offering to you for the competition, a quick quiz to see if you've been reading about us as you click through the links above and one to sign up for our newsletter. They're all pretty simple to do. If you need any help, give us a call or use the live chat where someone should be able to help you. Finally as a bonus for completing all the actions available, you can click the last option for 10 extra entries as our way of saying thanks for entering. Let us know what you think of the competition in the comments section. I would just like to say to Lumination how brilliantly you have helped me illuminate my home - which was a total renovation and refit..........not only were the range of products to choose from super but the staff were ten out of ten. Whether this entry ever makes it to the competition or not I still say thank you for all the friendly help you have given.